Next year's 27th ASEAN Summit in 2016 is about to get a whole lot more busier and, admittedly, a bit more exciting. It was announced yesterday by White House Deputy National Security Adviser Ben Rhodes that President Obama would be in attendance next year in Vientiane for the summit. This comes on the heels of Rhodes' recent trip this year on October 16 to Laos where he and other American officials along with their Lao counterparts marked 60 years of diplomatic relations between the two countries. What's more, all of this follows the visit of former Secretary of State Hillary Clinton when she visited back in 2012 which at the time made her the highest ranking American official to visit in 40 years. To a lesser known extent, there was also a July visit this year by US Vice-President Joe Biden's wife, Dr. Jill Biden. The posturing of American policy and its foray into Southeast Asia in recent years is a decisive one and decidedly poignant as it tries to balance its own interests in the region, as well as, assuaging allies, and attempting to counter the growing influence of China in the region. China with its own plan of engagement with Southeast Asia formally created a China Mission to ASEAN as recently as 2012. This occurred 10 years after having held the first ASEAN-China Summit back in 2002 in Phnom Penh - the summit that many often describe as China's largest official mark of engagement with ASEAN. Where formal political ties have grown, so have Chinese investments throughout Southeast Asia. The formalization of the ASEAN-China Free Trade Agreement occurred in 2007. Many economists acknowledge that Chinese investments throughout the region were already increasing significantly by that point. Case in point, The Economist reported that Lao-Chinese bilateral trade volume rose from US$1B in 2010 to over US$1.7B in 2012. Foreign direct investment by China in Laos reached US$5B in 2013. 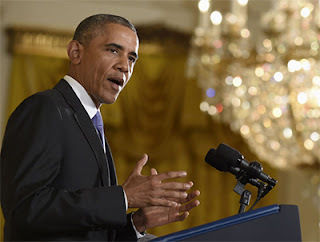 Economic influence in some respects is akin to direct political influence. That influence is shown during voting and deciding on specific issues or on what issues to even raise at the summit. Should contentious issues arise, you can be assured that no blame will be cast and no names will be mentioned, at least not by some. Some may argue that money can buy votes but it can also buy silence. Vientiane's growing relationship with Beijing has meant that Hanoi is ever more eager to maintain ties and increase cooperation with Laos. 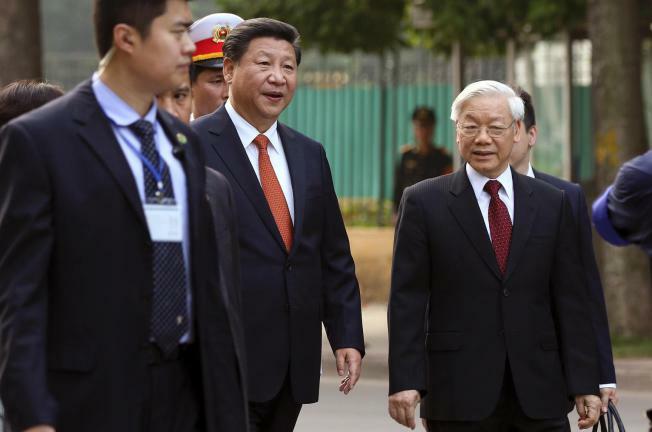 Some analysts have said that Vietnam appears anxious of losing one of its few remaining allies to one of its supposed longtime foe, China. However even this appears to be changing. China and Vietnam are cozying up to one another in spite of recent tensions on the maritime territorial dispute. For example, this week (November 4 2015) saw Chinese President Xi Jingping visit Vietnam promoting closer ties on a planned 2 day visit. Furthermore, with all things political set aside, China and Vietnam still have trade amounting to almost US$58B. This would make China Vietnam's largest trade partner. However year after year, whenever doubts grow about Lao allegiance to its long time ally of Vietnam surface, one inevitably hears about a new bilateral cooperation agreement in the news. Sometimes they simply repeat existing agreements to make headlines and almost always with the words of friendship and cooperation. In recent years, as has been reported in many news outlets, there has been a marked increase in cooperation on trade, security, and border issues. One recent headline by Vietnamese news site Tuoitrenews.vn even ran the headline "Vietnam and Laos agree to give highest priority to each other" (March 24 2015). A headline that sounds almost politically romantic. Of course such gestures are often made very publicly to affirm close ties, complete with the requisite shake of hands and smiles. 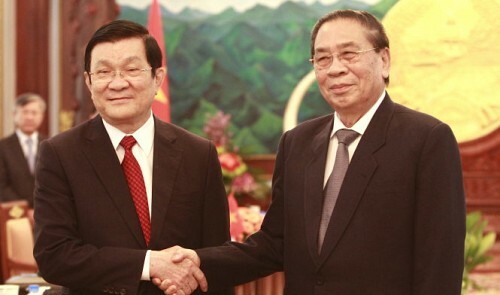 Vietnamese President Truong Tan Sang and Lao President Choummaly Sayasone. Laos has many partners now though and focusing on Vietnam would be too narrow considering the many players in the political game that Laos now faces. All this is to say that Laos' political position continues to grow in complexity in a way that no one foresaw even just 15 years ago. It remains incumbent on moderate, communist Laos to use this influence to benefit the country and it remains to be seen how its politicians will be able to juggle the issues of appeasing allies, remaining somewhat neutral and moving the country in a forward thinking manner towards prosperity and growth, among so many other issues. It is a balancing act that challenges even larger countries, let alone a smaller country like Laos. Nonetheless, it is a game it must master if it is to succeed. It remains a fascinating time for Lao international politics.